The Secession's presentation of Peter Doig has convinced me that the wide esteem for him is deserved. Not everything triumphs, and my fondness stops short of love. But so many of them are so damn impressive in so many respects that they earn admiration the hard way. Astonishingly, all the paintings are dated 2019. The intense production schedule had no deleterious effect on the quality. Finer soldiers are known to aim better when winded. Doig has been contemplating a prison in the neighborhood of his studio in Trinidad, gleaming yellow in the Caribbean light even as it shuts inmates away from it. He takes no particular stand on this, and lets the poignancy of the situation speak for itself in works like Lion in the Road (Sailors). Seeing the study Music (Two Trees) next the truck-sized Two Trees (Music) lends a glimpse into the process. 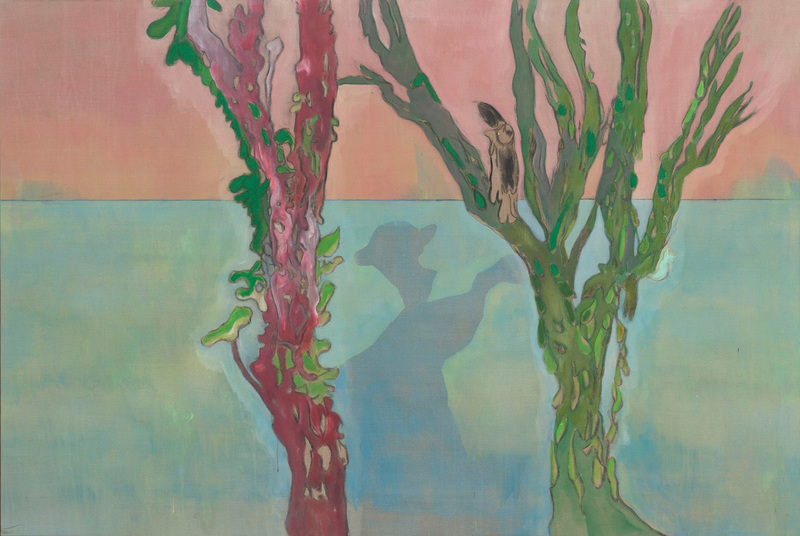 Between the former and the latter, Chagall-like figures of musicians fall away, leaving their sound recorded in the colors of dripped-wax trees before a teal sea and a tourmaline sky.